Australia is a land of immense work opportunities for skilled individuals who wish to immigrate to Australia. Apart from its varied attractions and a high quality of life, this great nation has a steadfast economy that allures people. Every year, thousands of individuals from overseas come to Australia to explore new career opportunities. For skilled workers, there are some visa options available to immigrate to Australia. 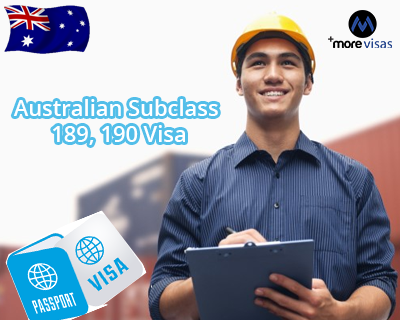 Here, we are listing out, two of these visa categories- Australia Visa Subclass 189 and Subclass 190. The difference between the two visas is being cited out here. Both these visas fall under the General Skilled Migration scheme. The Skilled Independent visa does not require any nomination from an Australian state or territory government. Those individuals, who are qualified professionals or trade persons with relevant work experience which will contribute to the economy of Australia, can apply for this Australian immigration visa. For them, state nomination is not required. It is an independent visa that allows the visa holder to live and work anywhere in Australia. This visa is also termed as the Skilled Nominated visa. As the name suggests, it requires nomination by the Australian state or territory government agency. The sponsorship is a mandatory requirement for this visa subclass. Such states or territories offer nominations to those individuals who are experts in certain occupations that are in demand in that state or territory. One has to fulfill certain obligations on being granted this Australian immigration visa such as the eligible candidate is required to live and work for a minimum of two years in the state which has nominated him or her. If an individual’s nominated profession is listed on the CSOL but not on the SOL, then they require the nomination of a state to be eligible for a visa. In a nutshell, the major difference between both the Subclass 189 and 190 visas lies in state sponsorship.